Welcome to the latest Never Mind The Adverts Here Are The Toys! Time to take a look at a toy that I always wanted as a kid but never had. Now, as an adult collector, I can finally say I have one! The original box is in a sorry state but the vehicle works perfectly (just needs a replacement bulb for the photon torpedo). 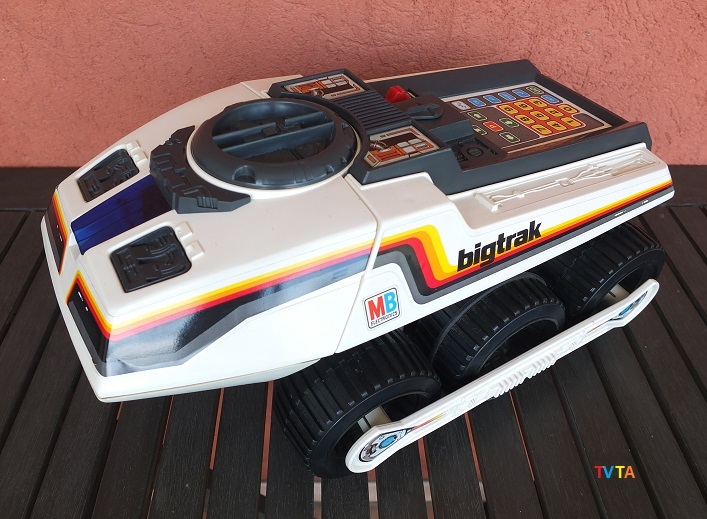 After a good clean up and a trip to the shops to buy a monster load of batteries, I had the Big Trak following my commands along the kitchen floor like a good one. Oh, and the thing was so noisy it set off the neighbour’s dog upstairs barking. Welcome to the world of the mighty electronic Big Trak! 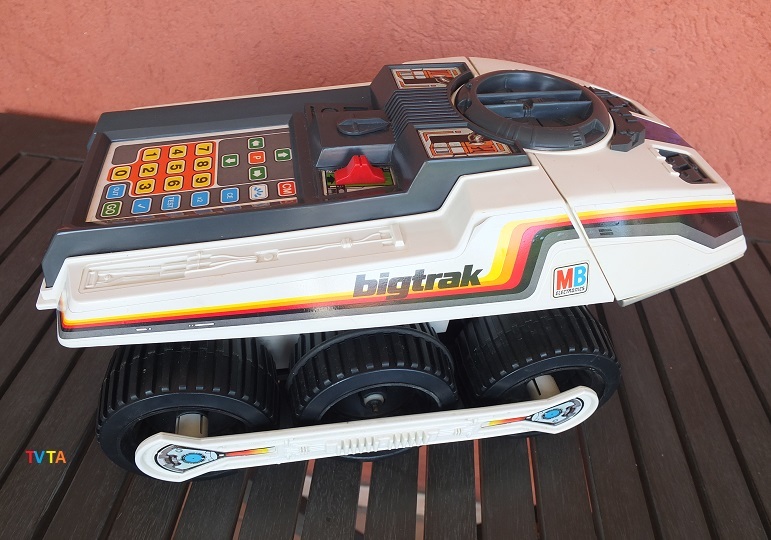 BIG TRAK (US) or Bigtrak (Europe) was a computerised toy vehicle created by Milton Bradley in 1979. 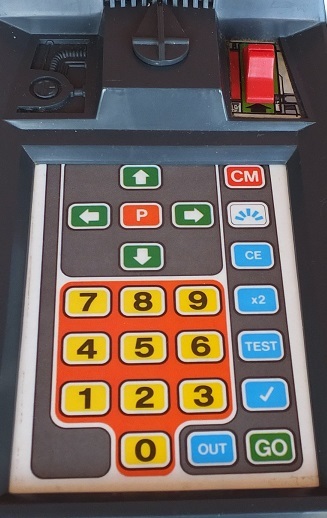 This six-wheeled tank-like space monster came with attractive decals, a front-mounted blue photon beam headlamp and an integrated programmable keypad that remembered up to 16 commands which it then executed in sequence. The US version was moulded in grey plastic while the European version was white. 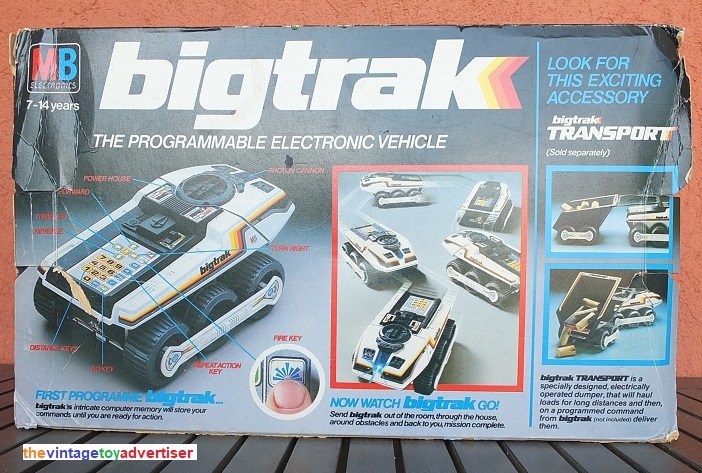 A companion unit was sold separately – the Big Trak Transporter – a trailer which could be attached to the rear that carried and dumped loads in response to Big Trak’s pre-programmed commands. 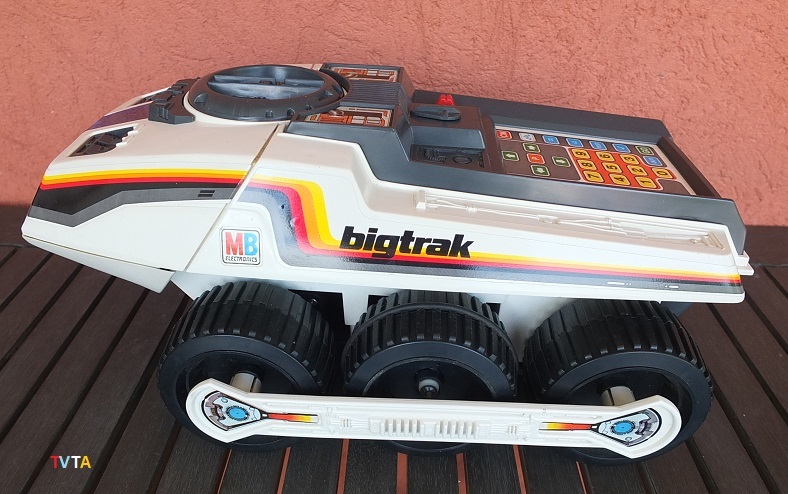 Big Trak was relaunched in 2010 by Zeon Ltd who produced replicas of the original. Thanks for requiring batteries with us 🙂 Join us again soon for another edition of Never Mind The Adverts! 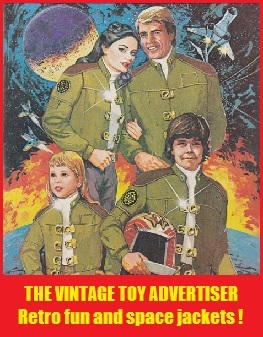 This entry was posted in Big Trak, Never Mind The Adverts... and tagged Big Trak toy, Big Trak Transport cargo trailer, Milton Bradley, Never mind the adverts here are the toys, retro, toys, TVTA, vintage advertising, vintage adverts, vintage Bigtrak, vintage electronic programmable space tank vehicle, vintage toys on June 24, 2018 by The Vintage Toy Advertiser. I remember this thing! 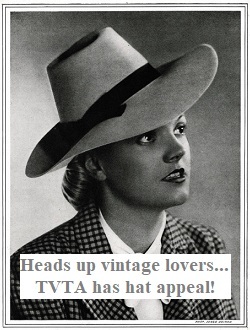 Never had one, but I do remember it… and I remember spotting one at a car boot sale a good 10 years or so ago and being mightily tempted!! Hi J, it’s a quality toy, very simplistic now but a pretty big deal as I remember it back in the day. I nabbed mine on the Bay recently for a good price, especially as it’s in such good nick and working – just minus a bulb. 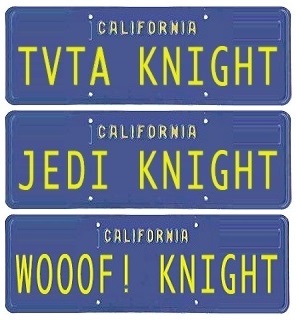 Still looking for one of those. Cool. I didn’t know about the Maxmachine so just tried to look it up. Was it a yellow Dodge type van with a huge controller? The one I saw was made by Schaper around 1977. That’s the one. If my timing is wrong, …. Well, it was a long time ago. I want a Peteena Poodle doll myself.